The Bottom Line: Lush and evocative. The perfect introduction to Sibel Hodge, one of the decade’s most dynamic literary talents. Set in the fictional West African country of Narumbe (you thought I was going to say Wakanda, didn’t you? ), author Sibel Hodge delivers a taut thriller that could be a bonafide blockbuster. While Hodge commits the cardinal sin of calling her own book “gripping” (check the cover image), the good news is that she’s not wrong. On a routine flight from Africa to England, Dr. Mason Palmer is tragically killed in a plane crash. Ten months later, widower Nicole Palmer is still trying to block out the grief of her husband’s sudden death, when she receives a photo of Mason, along with a message only he could have written. But when Nicole tries to find out if Mason is really alive and what actually happened to him in Africa, everyone she turns to for answers ends up dead. Determined to find the truth, Nicole uncovers a conspiracy that spans the globe, and discovers there are powerful people who are prepared to kill to keep her silent. In Nicole, Hodge has created the best kind of protagonist: victimized and vulnerable, yet too inspired to be beaten down. While tackling the sobering themes of child slavery and human trafficking, the book still reads like the best kind of thriller: one that leaves you white-knuckling the pages in the dead of night. Sadly, there is no audio version available. 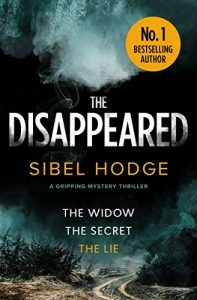 Let’s hope The Disappeared launches Hodge into the upper reaches of the bestseller list and finds its way onto Audible, where it would surely reach a huge audience.